Burro Wash is one of the many hidden canyons that emerge from the east side of the Waterpocket Fold in Capitol Reef National Park. Although just a flat, sandy streamway by the time it crosses the Notom-Bullfrog Road - the one access route into this area - not far upstream the wash begins to cut onto the strata and domes of the fold and encounters several extended narrow sections, moderately difficult to explore, with dark passages, frequent pools, dryfalls and chokestones. There are also more open sections, with fine views of the massive Navajo sandstone rocks at the center of Capitol Reef. The wash meets the mostly unpaved but good quality Notom-Bullfrog Road 8 miles south of its junction with UT 24, and is identified by a signpost. Parking is either in the streamway or by the side of the road. In the past, people with 4WD were able to drive up the sandy streambed for about a mile then park just before the canyon proper begins, but the BLM have now closed the wash to all vehicles. 13 views of Burro Wash.
TopoQuest topographic map of Burro Wash.
From the road, hikers walk upstream using footpaths to cut across meanders for about a mile, past several good places for camping beside the creek, shaded by large trees. Soon beyond the wash meets the first rocks at the edge of the Waterpocket Fold, where the canyon narrows and becomes littered with colorful pebbles and boulders. At first the drainage has various short, shallow, water-carved channels with nice pools, most of which can easily be bypassed at either side, though there is one potential pool up to three feet deep that may need wading quite early on. 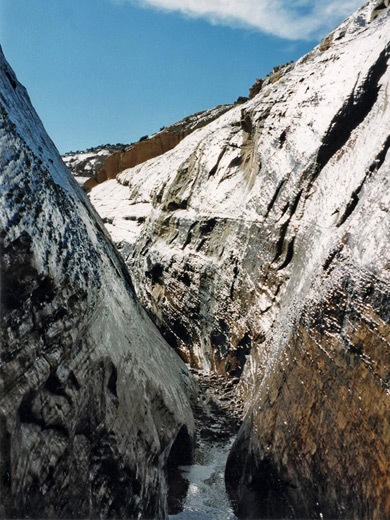 The surrounding rock layers are angled and are higher to the west, so often the canyon floor is nearly flat as it follows one type of rock, then has steps and channels as it cuts down into the next layer beneath. After around 2 miles, a sign marks the national park boundary. The first proper narrows start half a mile beyond and quickly become up to 10 meters deep but in places only 2 feet wide, bounded by dark, eerie rocks that create rather gloomy passageways, slanting sideways a little and rarely illuminated by sunlight. The floor often has a few pools, generally 1-2 feet deep but two large logs wedged high above warn of occasional much more severe flooding of the canyon. A chokestone and a 6 foot climb aided by a tree stump mark the end of this section. 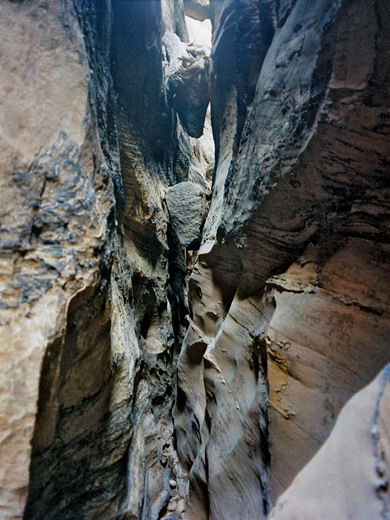 This is followed by some less deep narrows then a more open area - gone are the boulders and jumbled red strata of the lower canyon (the Carmel Formation); instead the wash has smooth sides and a clean sandy floor, and is surrounded by whitish rocks of the thick Navajo sandstone layer. Not far ahead, a long muddy pool begins - generally 2-3 feet deep and rather bad smelling if fresh rain has not recently fallen, with tidemarks on the walls that indicate the depth is sometimes 5 feet or more. The pool cannot easily be bypassed as the cliffs above become quite steep. 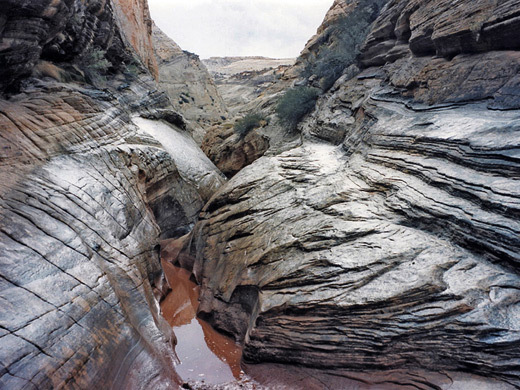 It extends for many meters, round several bends in the canyon, and is followed by other pools and medium-width narrows, before the wash enters a large open valley, right in the center of the reef and surrounded by huge white domes with some yellowish boulders and prominent strata - a very pretty scene. It takes ten minutes to walk across this open area to the far side, where the narrows resume. The channel at first is still quite open and harbors a few trees, followed by two 6 foot boulders to climb then a nasty debris-filled pool 3 feet or more deep that ends beneath a boulder. Again this would be more of an obstacle after recent rains. Past the boulder is a second very good dark slot section in which the floor narrows to a sharp point and some places the walls become less than 2 feet apart. The passage is mostly quite straight and also angled away from vertical somewhat, with minor obstructions caused by small boulders and shallow pools. It ends abruptly at a wider, circular area beneath a dryfall of about 10 meters, with a much shallower slot above. A rappel point at the edge shows that climbing down from above is possible, if exploration of the canyon begins at the top - access is from the rough Wildcat Canyon road that starts from near the end of the scenic drive in the national park. Despite the remoteness, several sets of footprints and car tracks at the lower end indicate that Burro Wash is visited quite regularly. A round trip to the dryfall takes from 4 hours (ca. 8 miles). Apart from the narrows, and the varied scenery and geology of Capitol Reef, this trip was memorable because of the weather, which fluctuated between bright sun and thunderstorms with heavy rain. It was most interesting to be in (a shallow part of) the narrows as the rain fell; above were smooth rocks, and an even sheet of water came down each side of the canyon making the walls glisten quite beautifully. This storm passed in less than 2 minutes, but this was enough to add about 3 inches to the depth of pools in the canyon and start a small stream flowing. In general of course, no slot canyon should be entered if rain has recently fallen or if future storms are approaching.